Converting images from one file type to another isn’t easy, especially when there are more than 100 image formats. There are many tools in the market but most of them are not so easy to use. Some even requires professional skill to use it. 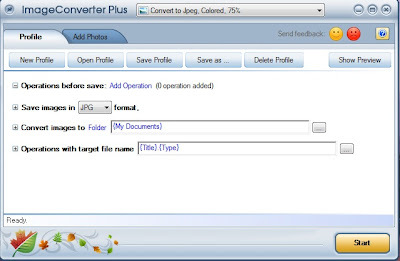 But among all these I found one image converter which fits all the criteria of being the best – ImageConverter Plus. ImageConverter Plus is a easy to use professional image conversion tool. It supports a large number of file formats. 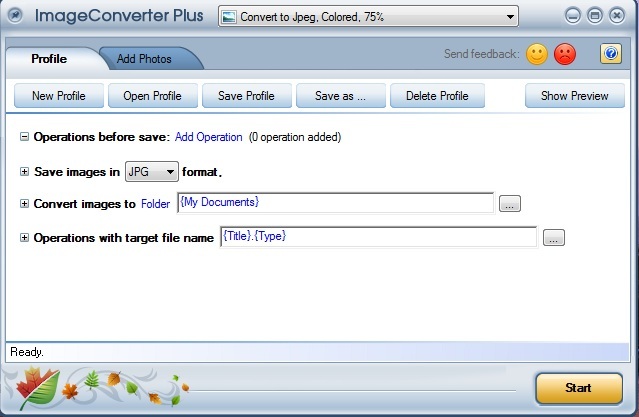 Not only does it convert images to different file formats it does have image editing options also. The most common ones being resize, rotate, crop, color effect, gamma, watermark etc. 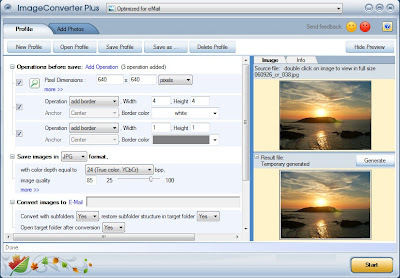 The ImageConverter Plus has a very easy to use interface. It has 2 main horizontal tabs, Profile and Add Photos. In the Add Photos section we have to add photos. We can add a single image or a folder of images. It has a preview section also to check the images. provide that. It makes it more easier to use and effective. The good thing about this software is you don’t have to depend only on the inbuilt profiles, as you can create numerous profiles as per your need. Creating profiles is not a tough job. It takes just few steps. Select the operations, and then add the file format, then the location and finally the filename. 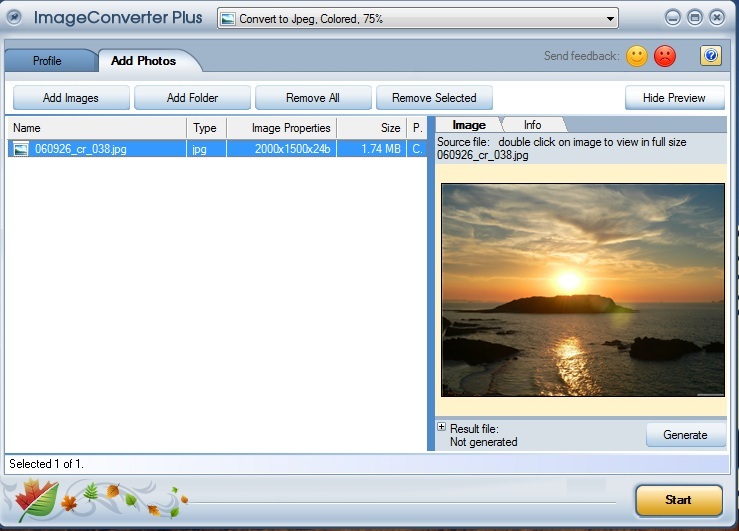 ImageConverter plus is definitely a very powerful image conversion tool. It is packed with features and also easy to use. It supports a lot of image formats and it has some very good editing tools also. Simple interface and ready to use inbuilt profiles makes it novice friendly. It is not like those professional converters in which you need to be an expert to use it. All in all it is the best image conversion tool. 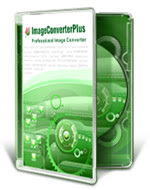 We GiveAway 9 activations/licenses for ImageConverter Plus. To join this contest follow us on Twitter and share this article with your friends. On 8. July 2011 we draw random from all comments 9 winners and send them instructions to activate the Pro version. Thanks for this great giveaway. Please count me too. I like the right click menu of Image Converter Plus in the windows explorer context menu. I like this program, very good software! Thanks for the giveaway! Count me in please. Nice review. I could use Image converter for my work. I do often convert images so it could be very useful. Please count me in. Thanks! Converting images could be useful. Nice Giveaway......! Count me in....! It's good software for photos. excellent software. thanks for this wonderful giveaway. I would like to win on license. Tweeted. Nice review. This software would make life easier. I am in also . this looks like a good program. Thank you for the nice offer. I would like to try out this software. Count me in for the nice giveaway. Good luck all :D.
Thanks for the contest and count me in. May I use this software.Thanks.